The moving averages we test show a moderating of upward momentum is taking place. The number of stocks that are above their 20-day moving average dipped a bit from last week and it has not yet recovered to the level of a month ago. The other moving average indicators, however continue to make slow but steady progress. The number of stocks above their 50-day MA increased ever so slightly. More importantly, the number of stocks whose 20-day MA has made a bullish cross-over above their 50-day MA continues to increase at a nice steady rate. Every week it seems another 300 or 400 stocks move into this category. To me, this is an indication that the market is in the process of making a real change from a bearish bias to a bullish bias. Two other indicators we measure are Aroon and Chaikin Money Flow. Aroon shows that the number of stocks in a strong up-trend has continued to increase; however, it also shows that the number of stocks falling into a strong down-trend has increased for two weeks now. I am hoping that the increase in stocks in a down-trend is the result of those stocks who missed earnings. Since we are in the middle of earnings season, it is possible that what we are seeing is the effect of positive and negative earnings and earnings expectations and how they are beginning to be reflected in this indicator. The Chaikin Money Flow indicator identifies stocks that are undergoing strong accumulation or buying. We see this indicator is also steadily moving upward. Not show on the chart is the number of stocks that are undergoing strong distribution or selling. This number has been pretty much flat for three weeks now. The bias here seems to be on the buy side. Bullish bias remains -- what could hold us back? The round up of technical indicators discussed above paints a relatively bullish picture of market action. Some of the indicators whose performances are moderating, though, show that the market is perhaps slowing its ascent. What's going on? There are two factors at work. First is earnings. This was supposed to be a disastrous quarter, reflecting a recession, soaring commodity prices, a weakened consumer and the ongoing credit crunch. What we are seeing so far, however, is that earnings are generally somewhere in the vicinity of "OK". For the most part, it is only the financial stocks and the airlines that are truly turning in awful earnings. Guidance from most companies has been cautious and why wouldn't it be in today's environment? So earnings not being as bad as investors had feared is a positive for this market. The second factor is the technical setup. Looking at the SPDR S&P 500 ETF (SPY) in the chart below, we can see that we are at a point where a number of indicators all come into play. We are up against the long-standing resistance at about $140. SPY has failed to break through this resistance several times already. We are up against the downward sloping trend line established back at the October high. We are at the top of the Bollinger Band range, indicating SPY is over-bought. 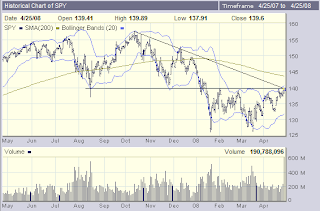 Finally, SPY is just a few points away from its 200-day moving average which is still sloping downward. It will be a real challenge for markets in general and SPY in particular to break upward through the resistance presented by these multiple indicators. The other major indexes are in more or less the same condition. The bullish bias inherent in the market statistics we are collecting leads me to be hopeful. We are seeing a general firming in stock prices across the board. A little patience and no major earnings disappointments from bellwether stocks and we just might see stocks break out and begin a significant move up.